Whilst the Coalition re-established Britain’s pre-crisis growth model, it effectively broke with the ‘One Nation’ hegemonic project which New Labour had pursued in office. In its place, the Coalition advanced a distinctive ‘two nations’ strategy which sought to build a limited but durable base of support. This chapter traces how this strategy underpinned the Coalition’s far-reaching programme of welfare restructuring and public sector retrenchment. The Coalition’s ‘two nations’ hegemonic project enjoyed a limited degree of success in the 2010–2015. 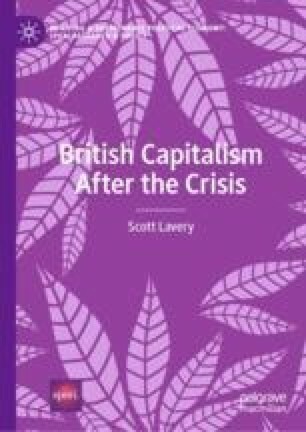 But it also eroded some of the key mechanisms which had stabilised British capitalism in the pre-crisis conjuncture and laid the conditions for a backlash in the subsequent period. BBC News. (2010). NI’s 100 Days Under the Coalition—BBC News. BBC News Website. Retrieved December 15, 2015, from http://www.bbc.co.uk/news/uk-northern-ireland-politics-11004792. Bozio, A., & Disney, R. (2011). Public Sector Pay and Pensions. IFS Green Budget. Retrieved December 13, 2015, from http://www.ifs.org.uk/budgets/gb2011/11chap7.pdf. Brewer, M., Dickerson, A., Gambin, L., Green, A., Joyce, R., & Wilson, R. (2012). The Impact of Employment Changes on Poverty in 2020. JRF—Joseph Rowntree Foundation. Retrieved December 12, 2015, from https://www.jrf.org.uk/report/impact-employment-changes-poverty-2020. Cameron, D. (2010). Conference Speech 2010: Together in the National Interest. BBC News Website. Retrieved December 6, 2015, from http://www.bbc.co.uk/news/uk-politics-11485397. Cameron, D. (2013). PMQs 6 November 2013. House of Commons Hansard Debates for 6 November 2013. Retrieved December 9, 2015, from http://www.publications.parliament.uk/pa/cm201314/cmhansrd/cm131106/debtext/131106-0001.htm#column_231. Duncan Smith, I. (2013). Speech to Capita Welfare Reform Conference. Capital Welfare Reform Conference. Retrieved December 13, 2015, from http://www.ukpol.co.uk/2015/12/03/iain-duncan-smith-2013-speech-to-capita-welfare-reform-conference/. Easton, M. (2011). Fair’s Fair. BBC News Website. Retrieved December 8, 2015, from http://www.bbc.co.uk/blogs/thereporters/markeaston/2011/02/fairs_fair.html. Eaton, G. (2010). Cameron Prepares to Go to War with the Trade Unions. The New Statesman. Retrieved December 14, 2015, from http://www.newstatesman.com/blogs/the-staggers/2010/07/cameron-unions-strike-assault. Exell, R. (2013). Inequality, Social Security and the Recession. TUC Touchstone Blog. Retrieved December 8, 2015, from http://touchstoneblog.org.uk/2013/05/inequality-social-security-and-the-recession/. Goulden, C. (2014). Budget 2014: Welfare Cap Protects Wealthier Claimants, Not Those in Greatest Need. Joseph Rowntree Foundation Blog. Retrieved December 10, 2015, from https://www.jrf.org.uk/blog/budget-2014-welfare-cap-protects-wealthier-claimants-not-those-greatest-need. Hern, A. (2012). George Osborne Doesn’t Like it if Your Blinds are Down in the Morning. New Statesman. Retrieved November 12, 2018, from https://www.newstatesman.com/blogs/star-spangled-staggers/2012/10/george-osborne-doesnt-it-if-your-blinds-are-down-morning. Osborne, G. (2010). Comprehensive Spending Review 2010. House of Commons Hansard Debates for 20 Oct 2010. Retrieved December 6, 2015, from http://www.publications.parliament.uk/pa/cm201011/cmhansrd/cm101020/debtext/101020-0001.htm. Osborne, G. (2011). Autumn Statement 2011: George Osborne’s Speech. The Telegraph. Retrieved November 3, 2015, from http://www.telegraph.co.uk/finance/budget/8923191/Autumn-Statement-2011-George-Osbornes-speech.html. Policy Exchange. (2013). What’s Wrong with the Tory Party? Retrieved December 7, 2015, from http://www.policyexchange.org.uk/media-centre/blogs/category/item/what-s-wrong-with-the-tory-party. TUC. (2013a). Support for Benefit Cuts Dependent on Ignorance, TUC-Commissioned Poll Finds. Trade Union Congress (TUC). Retrieved December 13, 2015, from https://www.tuc.org.uk/social-issues/child-poverty/welfare-and-benefits/tax-credits/support-benefit-cuts-dependent. TUC. (2013b). The UK’s Low Pay Recovery. Trade Union Congress (TUC). Retrieved November 2, 2015, from https://www.tuc.org.uk/sites/default/files/Lowpayreport.pdf. TUC. (2014). Public Sector Workers Lose Out on £2,245 Under This Government, Says TUC. TUC Press Release. Retrieved December 14, 2015, from https://www.tuc.org.uk/industrial-issues/public-sector/pay-fair-campaign/public-sector-workers-lose-out-%C2%A32245-under. YouGov. (2013a). Conservative for Economy, Labour for Living Standards? YouGov. Retrieved December 13, 2015, from https://yougov.co.uk/news/2013/10/10/conservative-economy-labour-living-standards/. YouGov. (2014). General Election 2015: How Britain Really Voted. YouGov Website. Retrieved December 15, 2015, from https://yougov.co.uk/news/2015/06/08/general-election-2015-how-britain-really-voted/.